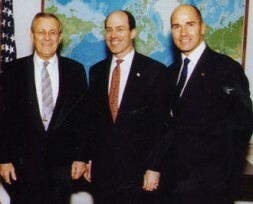 WSN Founder Dr. Hubertus Hoffmann (right) - here at a meeting with Secretary of Defense Donald Rumsfeld (left) and Inspector General Joe Schmitz in the Pentagon - : "Europe is in the danger to act with Provocative Weakness and Appeasement to the terrorist threat." Only 65 years after its worst diplomatic mistake that cost more than 50 million people their lives - the appeasement of Adolf Hitler at the Munich Conference – Europe is about to make the same mistake again, now in response to the terrorist threat of our time. 1. Spain´s newly elected Socialist Prime Minister Jose Zapatero repeated his promise to pull Spanish troops from Iraq in the absence of a UN mandate. This at the end is nothing else than capitulation to what Al Qaida intended with murdering 200 people in Madrid on March 11. In a 42-page document obtained by the Research Institute of the Norwegian Ministry of Defense in December 2003, Al Qaida wrote that Spain is the weakest ally of the US in Iraq. The document noted that terror in Spain would lead to withdrawal of her troops and that an attack would be most effective before election day. After only two to three attacks, "Spain would give up its engagement in Iraq," Al Qaida wrote. 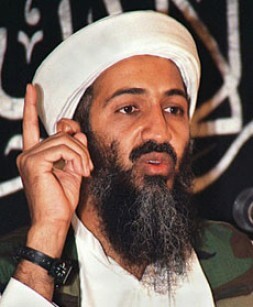 Congratulations Osama bin Laden! You got what you wanted from the new Spanish Prime Minister! Perfect targets and perfect timing too! It is worth bombing innocent people in Europe, it moves their weak democratic leaders to give-in and appease Al Qaida! 2. Even worse: The paper analyzed that "more countries will follow." The appeasement of Al Qaida by the new Spanish Government is an incentive for more killings in the world, maybe in Poland, Japan or South Korea in order to get their troops out of Iraq. Therefore, Mr. Zapatero is personally responsible when other allies of the US in Iraq get under attack. By "provocative weakness," he is provoking those attacks like Chamberlain did with Adolf Hitler in Munich in 1938. 3. The EU statement on Monday calling the killing of Sheikh Yassian “extra-judicial” and criticizing Israel for the elimination of the spiritual leader and founder of the terrorist group Hamas, seems to become another “Munich of Our Time” act. First of all, why is it legal to kill Osama bin Laden who was responsible for the September 11 murder of over 3000 people in the US and illegal to kill Sheikh Yassin, who killed with his terrorist organization Hamas between 100 and 300 civilians in Israel? Are Jewish lives less valued by European politicians than American? Second, Yassin had been warned again and again over the years but continued to promote killing innocent civilians in bars and buses in Israel. Should Israel not act, when deterrence has failed? Was the EU really active in deterring or containing the Sheikh or Hamas within the limits of international law and preventing them from killing women and children in Israel by suicide-bombings? Not at all. The EU ministers looked the other side and are therefore at least as guilty as the Israel government in failing to abide by international law. Congratulations Osama: You get from the new Spanish Prime Minister what you want ! Should there be no "Flexible Response" to terror at all? Where is the action plan of the EU for the Middle East? Is it only paper-work, easy to formulate, without power behind, helpless, "Include me Out" politics? Has Europe ever learned the very important lessons from the state-terrorist Adolf Hitler? Hitler´s war and Eichmann´s murders in Auschwitz were partly possible because the democratic leaders of that time missed the timing of the right action and failed to deliver a Flexible Response to a then new threat of terror. They failed to contain, deter, or even eliminate the monster at the beginning of his rule – from 1933 until 1939 for 7 long years. Millions of people died in the ensuing “clean” and certainly very legal World War II. Is this a very wise standard of international law we would like to continue in the year 2004? Is our international law protecting innocent citizens or their state-murders? Why a murder in a city like New York is hunted by an array of anti-terrorist forces, but a murder by a statesman of his won people, like Milosevic or Hitler, who also unleashed mass-murder outside of his borders, protected by "international law"? Even the law in the Middle Ages was wiser. The kings of the not very sophisticated old German tribes had to swear that it is their duty to continue the tradition of old rules and not become tyrants. French philosopher Jean-Jacque Rousseau wrote that the contract between a king and his citizens will be automatically annulated when the leader does not follow the system of constitution any more. 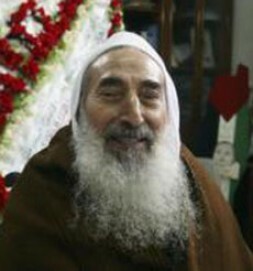 Hamas terrorist Yassin ordered the killing of 100 to 300 innocent civilians. Is killing himself "extra-judical" or an act of deterrence and the Right of Self Defense ? The Golden Bull of Braband, the constitution in the territory of now Belgium, the country where EU and NATO are now located, stated in the 13th century that "the king can only stay as a king when he respects the fundamental legal rights of his citizens." That was 700 years ago. Was Count Graf Stauffenberg, who dared to try to kill Hitler on July 20, 1944, "the illegal killer" and Hitler the victim of an out-of-law act? Was Stauffenberg the terrorist or was it Hitler? For hundreds of years there was always a fundamental and accepted "Right of Self Defense"
With this internal law, tyrants had to fear an impeachment by brave citizens. And what is the situation today in our Modern Times? Do we still not have the answer to act against state-terrorists without an all-out war to pre-empt them? Is the Free World still paralyzed to use weapons in flexible response against a lethal threat of murders coming from outside countries at the right time with as little casualties as possible? We need a new international law which may learn from the old Right of Self Defense. It can be simple: After terrorists act against civilians, the state has the right to react and defend its citizens by killing terrorists wherever they may hide, but only after the government of the state where the terrorists reside does not surrender them to the country where the citizens have been killed. A propaganda and support for suicide-bombing must be forbidden as well. Concerning Spain, I support Thomas Friedman’s idea in The New York Times from March 19 to send to Iraq a EU contingent of 5000 soldiers, including from Spain, in order to protect the UN return and oversea the first democratic elections in the country. Anything short of that reminded Friedman of Churchill´s remark after Chamberlain returned from signing the Munich pact with Hitler: "England has been offered a choice between war and shame. She has chosen shame and will get war." 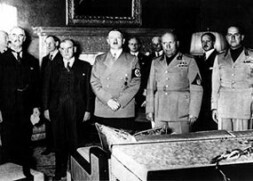 "Provocative Weakness" by the ignorant European Leaders Chamberlain and Daladier (left) at the Munich Conference in 1938 opened the door for Hitler´s World War II they tried to avoid. What has to be done in Israel and Palestine now? Promote Education for Tolerance among Palestinian and Israeli children. Stop “Education for Hate” propaganda in children’s text-books and materials. Stop Hamas and Palestinian radicals from killing more innocent people in Israel. Tear down the Israeli-built wall after the terror has declined to pre-Intifada level and the "Road Map" implemented. Ignore Yasser Arafat as the hidden mentor of terror. Stop the daily humiliation of Palestinians in their territories and create the conditions for Palestinian self-governance. Accept that after over 50 years 2-3 Million Palestinian refugees can not return to Israel any more. Fund their new future in the Arab World by EU and the US. Start a true "Reconciliation Process" by building hospitals and schools in Palestine with funds from Israel and a new dialogue, a two-track-strategy of defense of terror and a "Thoughtful Heart and a Loving Mind."